Score and 1 part. Volume I contains 20 pieces for alto recorder solo, ten duets for two alto recorders and 20 pieces for alto recorder and b.c. 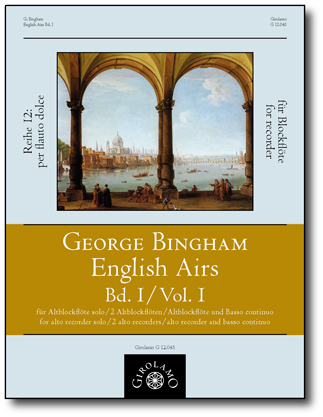 During the years from 1702 to 1705, four volumes of Airs Anglois were published by Roger & Le Cene in Amsterdam, containing solo pieces, duets, suite movements and sonatas for recorder composed by various English masters. These works were published by one George Bingham, who, as composer, also contributed the majority of the suite movements.